I’m a firm believer in the principle that there is something to be learned from every experience. Really, it’s wired into us biologically; but humans are complex creatures, and we often choose to ignore the learning that is clamouring for our attention with all the other input, both external and internal, that we are constantly subjected to. So when my two days of tabling at TCAF were, to put it bluntly, a financial debacle on a scale that I seldom achieve, not to mention a solid blow to my self-esteem, I had to keep reminding myself: “learning experience, it’s a learning experience!”. I still haven’t processed it entirely, and some of it is a little too close to the bone to share just yet, but here are some of my observations, some to do with selling comics, and some to do with travel in general. Three feet of table space is not very much. I’m going to have to start asking for more. There was no room for prints, and even though TCAF discourages prints in favour of books, many people had them, and as it was pointed out in one of the panels I attended, prints subsidize books because the profit margin is higher. Buy or make a collapsable book display. It would have been worth my suitcase space to bring a vertical display, like the one next to my display. Later that day I rearranged things to use some stands I had brought, and one of the unopened boxes of comics I had shipped (see next point), and it caught more attention, but still didn’t look as put-together as the shelf-type displays many people had. Gotta keep up with the Joneses! Don’t go for the cheap seats. I miscalculated here, thinking that I might have a better chance of getting in as a first-timer if I asked for the humbler space. Maybe I did, but there was a reason those tables were less: they were on the third floor, which got substantially less traffic than the first and second. By the time many people got up to us, their eyes were glazed, their feet hurt, they had spent all their money, and they were considerably harder to engage with than if we had been in a more accessible location (I imagine). If you are called up from the waitlist, consider if there is time to get organized. Being on a waitlist puts one at certain disadvantages. With just three weeks to prepare, I was thrown into a frenzy of travel planning, postponing projects I was working on, and trying to wrap up things that needed to be done. It left me little time to do the social media work I needed to do in advance, and I think that showed. The day after I returned home, jet-lagged and shell-shocked, I got an email from VanCAF (which was the following weekend) telling me that I was being called up off their wait-list and that I could have a half-table — having learned my lesson that if three weeks was not enough, three days in that condition certainly wasn’t, I regretfully declined. Take public transit instead of taxis if possible. When I arrived, it was late in the day, I was totally beat, I didn’t know the city, and took what I thought was the easy way out — an official airport limo (which are the only ones Toronto airport allows to pick up passengers there). What followed was the most hair-raising ride of my life: the driver was texting, smoking an e-cigarette, pouring coffee from a thermos, swerving at high speed in and out of traffic without signals, turning back to talk to me (I wasn’t encouraging this), and at one point even decided he had to show me something on his phone, so called up a video while driving and handed it to me! When we reached downtown, he continued to drive this way, and another driver even pulled up beside us and yelled “you’re gonna kill someone!”. By this point I was absolutely petrified with fear, and just hoped to make it to my hostel in one piece; I was too freaked out even to get his cab number. Six days later, on my way back to the airport, I was meeting a relative for lunch, and decided to take transit the whole way. It was a breeze — the subway (with which I’d gotten familiar over my stay), and a dead-easy connection to the airport bus. Never again will I take a taxi if I can possibly take transit — a little research in advance would have saved me a few new grey hairs — and about $75! Stay in a Hostel. Now, this one I got right in advance. The last time I was in Toronto, I stayed in the All Days Hostel, just a kilometre from the TCAF site, and a block and a half from the subway (at that time, I was able to walk the full distance, so I also got a lot of fresh air and exercise, and only took the subway when I was in a hurry). I decided to stay there again, but this time opted for an ensuite. The first time I’d had my own room, about $300 for five days, but sharing the loo and showers. This time I decided I wanted more privacy, due to not being in tip-top shape at the moment, and decided an extra $200 was worth it. If you’ve never stayed in a hostel, or only stayed in the group rooms because they’re super cheap, it’s worth checking out the more expensive arrangements which many places have. I spent about half of what the hotel deal for TCAF participants was ($200/night). True, I was not right on site, but I had a nice room with my own shower, a full kitchen right outside my door, and interesting people from all over the world to talk to. Decide what comfort level you need and spend the money on yourself; you’re worth it. Take a helper. Especially if you’re like me and have physical challenges. I really could have used some extra muscle, and someone to run errands and give me a break at the table. Also, it would have been nice just to have some company. Although I met a lot of really nice people, it would have been comforting to have someone to share it with. Ask for help, and accept it if offered. I found people incredibly helpful (the little-old-lady-with-cane thing helps, too). Young people offered to help me on the subway stairs with my suitcase (the escalators were always going the wrong way) and my book boxes at the con; people would stop their busy rush to give a stranger directions; my neighbours kept an eye on my table when I had to take a loo break; the fellow with the table next to me offered to wait and call me a cab for the trip back to my hostel with the boxes of books (who knew you had to have an app for a taxi nowadays?!? ), which he not only did, but waited until I was ensconced in the cab, which was a much better ride than the airport limo. We are all connected, and people are by and large kind, and it’s good to remember that on the receiving end sometimes. Besides, it makes people happy to be helpful, so you’re actually doing something nice for them too! Some people will get it, some won’t. Throughout the two days of the con, I struggled with people’s perception that my books are only for children. 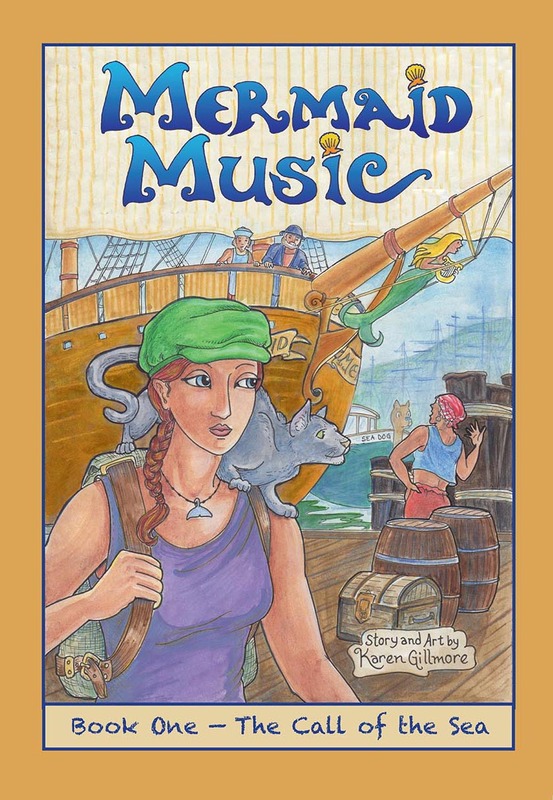 “All-ages” seems to make people automatically assume “kids”, and my covers, I confess, are bright and fun and don’t really make people think of “grownup” subjects. Nevertheless, there were some people that just immediately connected with the humour; their eyes would light up when they saw my books, and they would giggle while leafing through them. 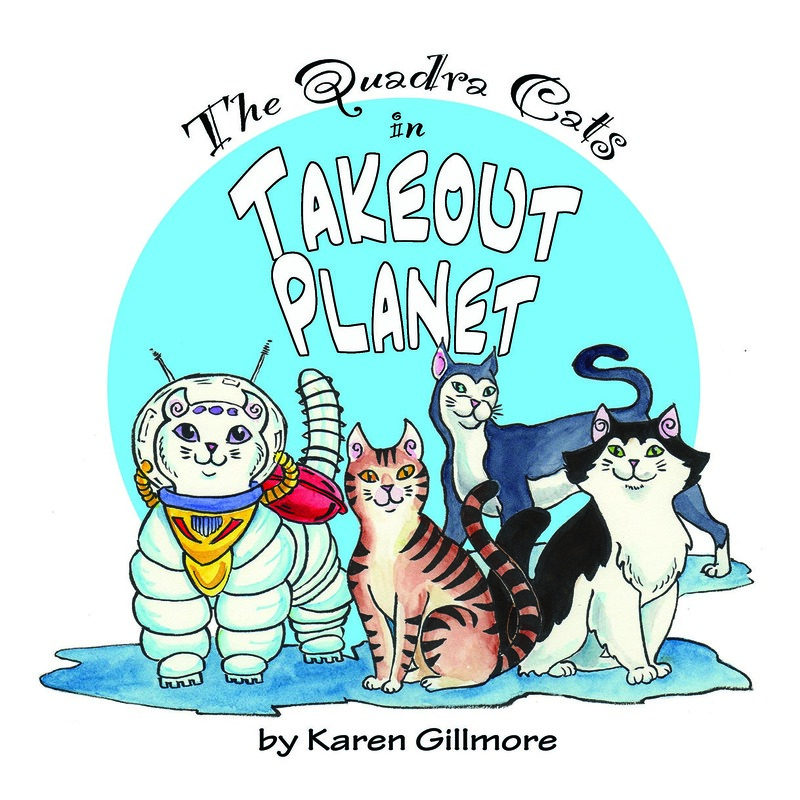 Some bought, some didn’t, but I handed out a lot of cards and Quadra Cats postcards. Those people are my audience, and I wish to heck I knew how to identify them out there in the world at large! Somewhere, there is a connection between all those folks and my stories, and I will find it. So, where do I go from here with all this expensive new wisdom? I guess I’ll know when I get there. For now, I know I’m going to be scaling back on travel (unless someone pays my way! ), and working on my local and internet base. I’m going to continue to make my comics and art the best comics and art that I can make, and experiment with different ways of getting them out into the world. I’m going looking for my audience. Spotted on the shelves of the Toronto Reference Library, across from my table. Thanks for reading, and keeping me (virtual) company on this journey. I always love to hear your feedback in the comments — do you have any hard-won wisdom from your own efforts to connect your creativity with the world? Thanks for the encouragement, Karen! Yes, I think we all go through this at one time or another in our creative lives, no matter what we’re creating. I’ve been selling my art for over 40 years, but started doing comics six years ago, and it’s been hard getting traction. For me it was a major wakeup call to go looking for my audience rather than just casting stuff into the commonly accepted channels and hoping they were there. Best of luck in your own creative endeavours! I would have dropped by and helped, but I was out of town! I am sorry you didn’t know about the UP Express train between the airport and downtown. It’s the best, and only about $12. And yes–I think tabling at TCAF-sized events where you are not in your hometown only works if you’ve built a big following on social media, and have a super-awesome display with lots of give-aways. Thanks, Jaleen! It would have been really fun to have you there. Maybe another time! No, I didn’t know about the train, that would have been great. But the Subway/Airport Rocket Express was fantastic, especially since I was right on the subway line, and it wasn’t rush hour. I’ll check that train out next time. I think I’m going to stick to local events for the next couple of years unless something amazing happens and I go viral (haha)! I did have lots of postcards to give away; what other kinds of giveaways have you seen people with? A few years back, I was accepted into Circle Craft in Vancouver. It was in my mind the top craft show and I did not feel ready for it for many years, even though I always did really well at juried shows. Well, finally I took the leap, was accepted, and spent a TON of money on it, made a TON of stock, hired my friend to help, made a new display, etc. etc. Well…. It was a huge failure!! I was miserable. So, like you, I did not give up and did a local show the following year where I made a ton of money on all the stock that I had already made. So it was a breeze and renewed my faith in myself. Now, I have retired from all wholesale and craft shows. It feels so good! I am doing something completely different after 30 years of artisan sales. Only doing Etsy right now and loving it, but the trick is… I don’t have to earn a living. That makes life easier by a jillion! So, be brave and keep at it! You are so incredibly talented! Thanks, Marcia! I had the same experience some years ago (pre-comics) with one of the “big” shows here. It had been a while since I’d done a big craft fair, and I discovered that it wasn’t enough to just have good art anymore, you had to have a fancy store-like display. Arg! Also people didn’t seem to be interested in paintings; they wanted gift-type items. Again, I was in the wrong place, wrong audience. All we can do is learn from this kind of stuff and adapt. And as you say, I now am really well-prepared with stock for the next show, which is Van Isle Con in Sidney, coming up quick! I’m really looking forward to it; it was a really good event last year, and I’m sure will be even better this year. Lately that word “retire” has been on my mind, since everyone I know seems to be doing it. I never thought it would be something I would want to do, because we artists never stop making art, right? But there is a difference between having to make and sell art to make a living, and being free to make the art you want when the selling is a bonus. I do like that idea, and congratulations on having reached that point!